There have been six US Navy ships named after the historic Battle of Saratoga. The most recent was the USS Saratoga, commissioned as a US Naval Attack Aircraft Carrier (CVA-60) in 1956 and retired from service in 1994. 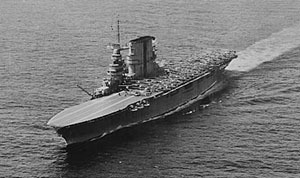 The USS Saratoga had a long and illustrious naval history. For nearly forty years she served in the Mediterranean, in the waters off Guantanamo Bay during the Cuban Missile crisis, off the coast of Lebanon during the six day war, and as part of the Vietnam War cruise in 1972, for which she received one battle star for service. During the 1950s, President Dwight D. Eisenhower and select members of his cabinet boarded the ship for two historic days of demonstrations for state-of-the-art air, antisubmarine, missile and bombing operations. During the 1960s, President Richard Nixon was on board for a firepower demonstration. He boarded once again in 1970 upon the death of the President of the United Arab Republic with his Joint Chiefs of Staff and the Secretaries of State and Defense for intelligence gathering purposes. During the 1980s she was involved in the dramatic rescue of the hijacked luxury liner Achille Lauro. Upon the orders of President Reagan, seven F-14 tomcats were launched from her deck, surrounded the hijacked liner and forced her to land in Italy, where the hijackers were taken into custody. The USS Saratoga served during Operation Desert Storm from August 1990 until March 1991. She logged 11,700 arrested landings, 12,700 sorties and traveled 36,382 miles. Her last deployment to the Mediterranean ran from January to early June of 1994. She returned to Naval Station Mayport in Florida where she was decommissioned. After proudly serving the US Navy, the ship was docked at the Naval Station in Newport, Rhode Island, thus concluding a well-known chapter in Saratoga Springs history.